As discussed in Device Emulation, there are multiple ways and places to handle I/O emulation, including HV, SOS Kernel VHM, and SOS user-land device model (acrn-dm). Maintain lists of port I/O or MMIO handlers in the hypervisor for emulating trapped I/O accesses in a certain range. Forward I/O accesses to SOS when they cannot be handled by the hypervisor by any registered handlers. Trap and decode I/O access by VM exits and decode the access from exit qualification or by invoking the instruction decoder. If the range of the I/O access overlaps with any registered handler, call that handler if it completely covers the range of the access, or ignore the access if the access crosses the boundary. If the range of the I/O access does not overlap the range of any I/O handler, deliver an I/O request to SOS. CONFIG_PARTITION_MODE is the only configuration option that affects the functionality of I/O emulation. With CONFIG_PARTITION_MODE enabled, the hypervisor never sends I/O request to any VM. Unhandled I/O reads get all 1’s and writes are silently dropped. I/O emulation does not rely on any calibration data. Port I/O accesses are trapped by VM exits with the basic exit reason “I/O instruction”. The port address to be accessed, size, and direction (read or write) are fetched from the VM exit qualification. For writes the value to be written to the I/O port is fetched from guest registers al, ax or eax, depending on the access size. MMIO accesses are trapped by VM exits with the basic exit reason “EPT violation”. The instruction emulator is invoked to decode the instruction that triggers the VM exit to get the memory address being accessed, size, direction (read or write), and the involved register. The I/O bitmaps and EPT are used to configure the addresses that will trigger VM exits when accessed by a VM. Refer to IO/MMIO Emulation for details. When a port I/O or MMIO access is trapped, the hypervisor first checks whether the to-be-accessed address falls in the range of any registered handler, and calls the handler when such a handler exists. Each VM has two lists of I/O handlers, one for port I/O and the other for MMIO. Each element of the list contains a memory range and a pointer to the handler which emulates the accesses falling in the range. See Initialization and Deinitialization for descriptions of the related data structures. The I/O handlers are registered on VM creation and never changed until the destruction of that VM, when the handlers are unregistered. If multiple handlers are registered for the same address, the one registered later wins. See Initialization and Deinitialization for the interfaces used to register and unregister I/O handlers. If the range of the I/O access falls completely in the range the handler can emulate, that handler is called. Otherwise it is implied that the access crosses the boundary of multiple devices which the hypervisor does not emulate. Thus no handler is called and no I/O request will be delivered to SOS. I/O reads get all 1’s and I/O writes are dropped. If the range of the I/O access does not overlap with any range of the handlers, the I/O access is delivered to SOS as an I/O request for further processing. An I/O request is delivered to SOS vCPU 0 if the hypervisor does not find any handler that overlaps the range of a trapped I/O access. This section describes the initialization of the I/O request mechanism and how an I/O access is emulated via I/O requests in the hypervisor. For each UOS the hypervisor shares a page with SOS to exchange I/O requests. The 4-KByte page consists of 16 256-Byte slots, indexed by vCPU ID. It is required for the DM to allocate and set up the request buffer on VM creation, otherwise I/O accesses from UOS cannot be emulated by SOS, and all I/O accesses not handled by the I/O handlers in the hypervisor will be dropped (reads get all 1’s). Refer to Section 4.4.1 for the details of I/O requests and the initialization of the I/O request buffer. PIO A port I/O access. MMIO A MMIO access to a GPA with no mapping in EPT. PCI A PCI configuration space access. WP A MMIO access to a GPA with a read-only mapping in EPT. For port I/O accesses, the hypervisor will always deliver an I/O request of type PIO to SOS. For MMIO accesses, the hypervisor will deliver an I/O request of either MMIO or WP, depending on the mapping of the accessed address (in GPA) in the EPT of the vCPU. The hypervisor will never deliver any I/O request of type PCI, but will handle such I/O requests in the same ways as port I/O accesses on their completion. Refer to Data Structures and Interfaces for a detailed description of the data held by each type of I/O request. Each slot in the I/O request buffer is managed by a finite state machine with four states. The following figure illustrates the state transitions and the events that trigger them. The I/O request slot is not used and new I/O requests can be delivered. This is the initial state on UOS creation. The I/O request slot is occupied with an I/O request pending to be processed by SOS. The I/O request has been dispatched to a client but the client has not finished handling it yet. The client has completed the I/O request but the hypervisor has not consumed the results yet. The contents of an I/O request slot are owned by the hypervisor when the state of an I/O request slot is FREE or COMPLETE. In such cases SOS can only access the state of that slot. Similarly the contents are owned by SOS when the state is PENDING or PROCESSING, when the hypervisor can only access the state of that slot. To deliver an I/O request, the hypervisor takes the slot corresponding to the vCPU triggering the I/O access, fills the contents, changes the state to PENDING and notifies SOS via upcall. On upcalls, SOS dispatches each I/O request in the PENDING state to clients and changes the state to PROCESSING. The client assigned an I/O request changes the state to COMPLETE after it completes the emulation of the I/O request. 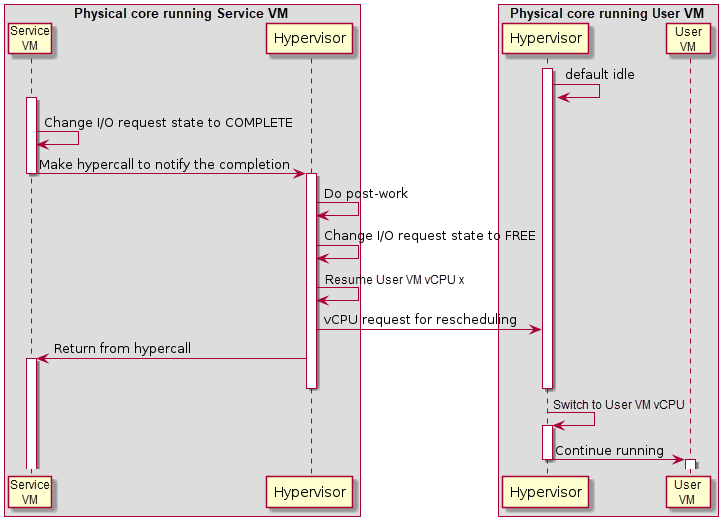 A hypercall is made to notify the hypervisor on I/O request completion after the state change. 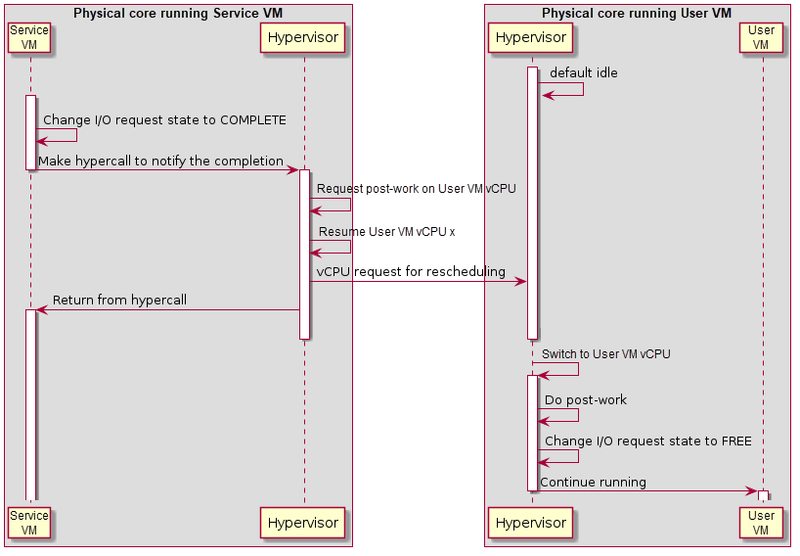 The hypervisor finishes the post-work of a I/O request after it is notified on its completion and change the state back to FREE. States are accessed using atomic operations to avoid getting unexpected states on one core when it is written on another. Note that there is no state to represent a ‘failed’ I/O request. SOS should return all 1’s for reads and ignore writes whenever it cannot handle the I/O request, and change the state of the request to COMPLETE. After an I/O request is completed, some more work needs to be done for I/O reads to update guest registers accordingly. Currently the hypervisor re-enters the vCPU thread every time a vCPU is scheduled back in, rather than switching to where the vCPU is scheduled out. As a result, post-work is introduced for this purpose. 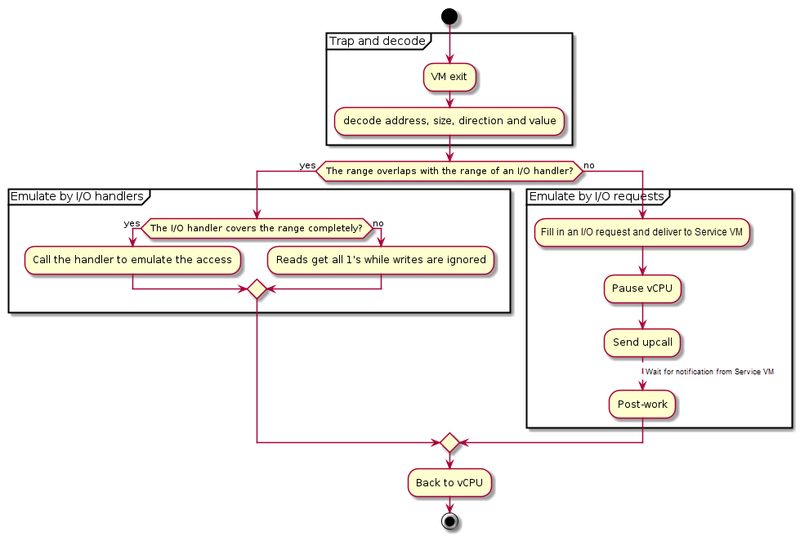 The hypervisor pauses a vCPU before an I/O request is delivered to SOS. Once the I/O request emulation is completed, a client notifies the hypervisor by a hypercall. The hypervisor will pick up that request, do the post-work, and resume the guest vCPU. The post-work takes care of updating the vCPU guest state to reflect the effect of the I/O reads. The figure above illustrates the workflow to complete an I/O request for MMIO. Once the I/O request is completed, SOS makes a hypercall to notify the hypervisor which resumes the UOS vCPU triggering the access after requesting post-work on that vCPU. After the UOS vCPU resumes, it does the post-work first to update the guest registers if the access reads an address, changes the state of the corresponding I/O request slot to FREE, and continues execution of the vCPU. Completion of a port I/O request (shown in Figure 66 above) is similar to the MMIO case, except the post-work is done before resuming the vCPU. This is because the post-work for port I/O reads need to update the general register eax of the vCPU, while the post-work for MMIO reads need further emulation of the trapped instruction. This is much more complex and may impact the performance of SOS. The following structures represent an I/O request. struct vhm_request is the main structure and the others are detailed representations of I/O requests of different kinds. Refer to Section 4.4.4 for the usage of struct pci_request. For hypercalls related to I/O emulation, refer to Section 3.11.4. Describes a single IO handler description entry. The base port number of the IO range for this description. The last port number of the IO range for this description (non-inclusive). A pointer to the “read” function. The address of the port to read from. The width of the read operation (1,2 or 4). The implementation must return the ports content as byte, word or doubleword (depending on the width). If the pointer is null, a read of 1’s is assumed. A pointer to the “write” function. The address of the port to write to. The width of the write operation (1,2 or 4). The implementation must write the value to the port. If the pointer is null, the write access is ignored. The following structure represents a MMIO handler. Structure for MMIO handler node. A pointer to the handler. The function for handling MMIO accesses to the specified range. Private data used by the handler. The pointer to any data specified at registration. This pointer is passed to the handler whenever the handler is called. The struct to make a bi-directional linked list. This member is used in pair with range_end. See the documentation of range_end for details. where address and size are the starting address of the MMIO access and the number of bytes to be accessed, respectively. Otherwise the behavior is undefined. Allow a VM to access a port I/O range. This API enables direct access from the given vm to the port I/O space starting from port_address to port_address + nbytes - 1. Register a port I/O handler. This API registers a MMIO handler to vm before it is launched. Deliver io_req to SOS and suspend vcpu till its completion. The handler of VM exits on I/O instructions.